Did I mention how hard it is to tell Dean’s shirts apart? 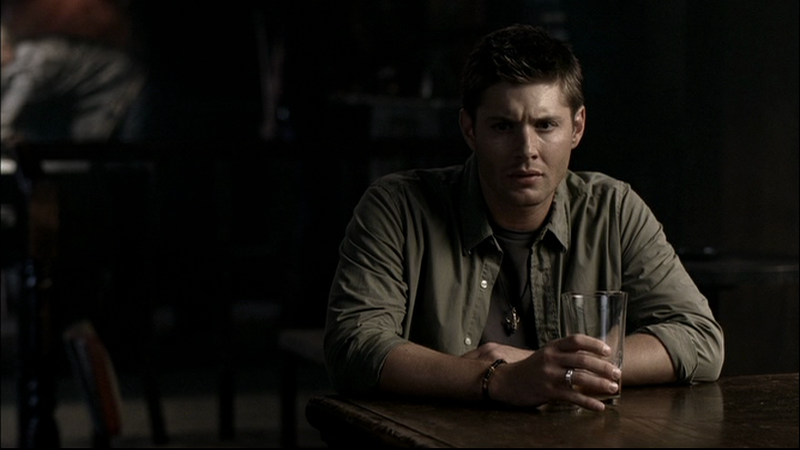 (Dean pretty much sums up how I feel in the first cap). This is a nice dress shirt that sometimes looks a little green, but most of the time looks beige. It has a left breast pocket, with no flap, and a little decorative stitching. It’s a button down, with shiny white buttons (these are actually the most distinctive thing about this shirt). Ah ha! The reason this shirt sometimes looks green and sometimes looks beige is because it's two shirts! Or rather, it's the same shirt in two different colours. One is green and one is beige. Because the colour filters on this show make it very hard to tell green and beige apart, I'm still listing them both under one entry. In Dead Man’s Blood (1x20), Dean wears the shirt for the entire episode, except for the final scene when his Dad agrees that they should work together. 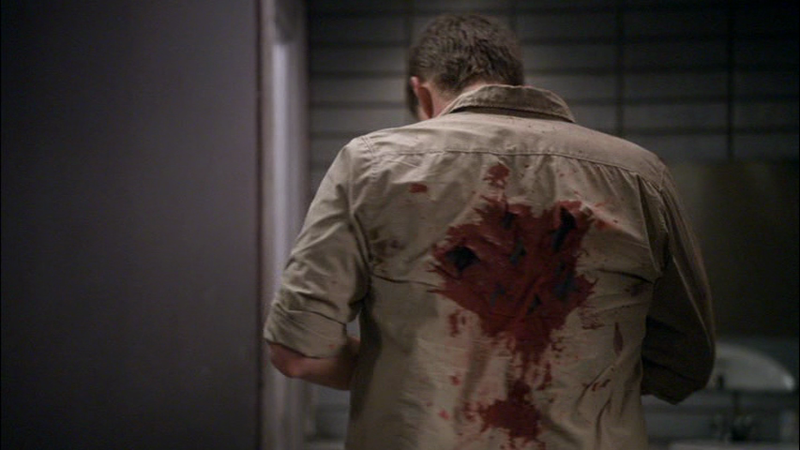 In Simon Said (2x05), Dean wears it from the beginning of the episode up until he and Sam leave the Roadhouse and drive to Guthrie OK.
It’s hard to tell, but this may be the shirt that Dean wears in Hunted (2x10). He wears it for the entire episode, except for the very first scene. In Hollywood Babylon (2x18), Dean wears this shirt after the first real death (guy hung from the rafters) until the second death (guy thrown into giant fan). In Red Sky At Morning (3x06), Dean wears it when they are packing up at the end of the episode and Bella arrives to pay them for their services. He leaves it on for the final driving scene too. In A Very Supernatural Christmas (3x08), Dean wears it at the end of the episode when he and Sam celebrate Christmas. 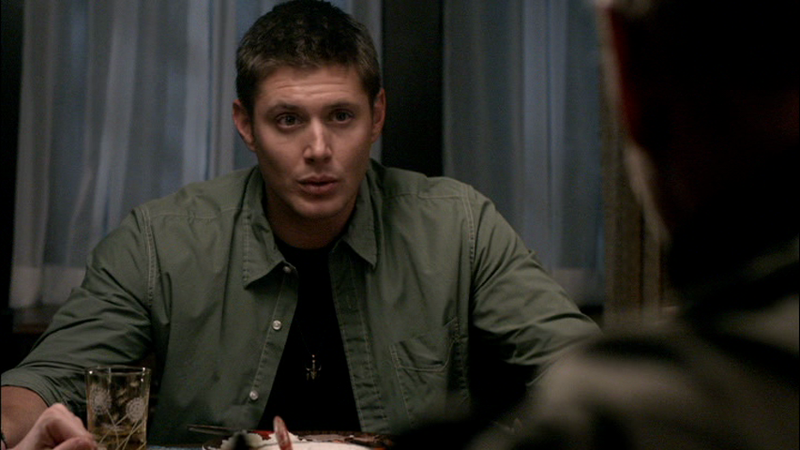 In In The Beginning (4x03), Dean wears it for the entire episode. 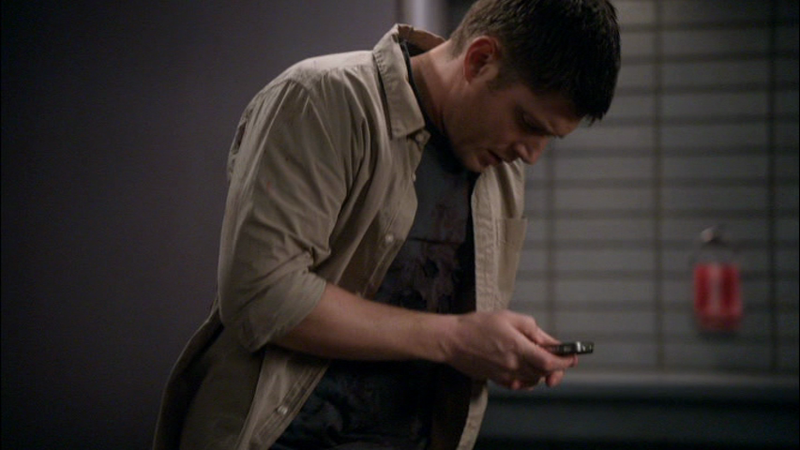 In Metamorphosis (4x04), Dean is still wearing this shirt, as the action follows immediately from the previous episode. He changes out of it after his argument with Sam and before the drive to Carthage to check out Jack Montgomery. In Wishful Thinking (4x08), Dean wears it at the very end of the episode, when he admits to Sam that he remembers Hell. In Family Remains (4x11), Dean wears it from the beginning of the episode until the family is saved (with a brief break for wearing a suit when they interview the housekeeper). In After School Special (4x13), Dean wears it in the “present” for the entire episode, except when he is in his gym-teacher outfits. In Dark Side of the Moon (5x16), this is the shirt Dean is wearing when he is shot. In Defending Your Life (7x04), this may be the shirt Dean is wearing while he talks with Sam next to the Impala at the end of the episode. In Season 7, Time for a Wedding (7x08), this may be the shirt Dean is wearing when he follows Sam and Becky to Delaware and then sees the strange news story in the paper. I think the website I'm going to for American Eagle shirts, is the American Eagle Outfitters? Is this it? It seems very boyish clothes and not workers looking clothes at all, any advice, anyone? Thanks so much! This has happened before. I'll make a note on the entry that it's two shirts.